Out Of The Box is a children's television series that aired on Disney Channel from 1998 through 2004. The show was based on the works of Douglas Love and took place in "The Box", where the show's two hosts, Tony and Vivian, would have kids from the neighborhood video and do various activities, including craft-making, singing and performing plays. The episodes "Let's Eat Out", "The Gift" and "Treasures" were mysteriously removed from regular rotation after season 2 premiered in 1999, never to be broadcasted again. No one knows for sure what these episodes feature, but it is speculated that they were removed from reruns due to being too similar to some season 2 episodes (for example, "Let's Eat Out" sounds very similar to season 2's "Out to Lunch"). The show had 82 episodes spread across 3 seasons, but only two of them, "Happy Holidays" and "Halloween", were released to home video. There were two VHS releases: the first was of the episode "Happy Holidays" and the second release had the episode "Halloween" on it. In addition, "Halloween" was released on the DVD Rolie Polie Olie: A Spookie Ookie Halloween and The Book Of Pooh: Just Say Boo! as a bonus feature. Besides this, only two other episodes ("Box Full of Boxes" and "Mirror, Mirror") have been found in full, alongside clips of "Revealing Feelings" and "Loud and Soft". See "episodes removed from reruns" for further information on episodes 6,21 and 22. ↑ Amazon listing for "Out Of The Box: Happy Holidays". Retrieved 15 Oct '18. ↑ Amazon listing for "Out Of The Box: Trick Or Treat". Retrieved 15 Oct '18. 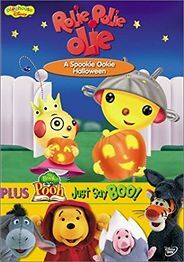 ↑ WorldCat listing for the Rolie Polie Olie and Book of Pooh DVD that contains "Halloween". Retrieved 15 Oct '18.